Out near Nishi 18 Chome station on the Tozai line, Maruyama Mushroom offers (according to the English slogan) hamburg steak and casual French food and despite the fact that I can't stand mushrooms I thought I'd check it out! And it looked very nice. I pushed the boat out a little more and had the hamburg with Parmesan risotto which was really good. Mushrooms, actually, weren't all that obvious in the dishes. Since I really don't like them I did ask - um, does this have lots of mushrooms in it? And the waitress said it did, but very quickly said that they could leave them out if I wanted. And I wanted, so they did, but I'm a little curious as to what they left them out of. The hamburg? The risotto? The salad? And for that matter I was feeling guilty because the chef is clearly very serious about his food, has called the place Mushroom and I was asking him not to include them? Well, I enjoyed it in the end, and he didn't look too put out so I hope it was ok. If you're in the Maruyama-ish area this place is worth checking out, and it's on my map. I'm glad I got over my distaste for the name to try it! I knew that there were a bunch of branches of Soup Curry Samurai around, but I didn't know until recently that one of my friends rates it as the best place in Sapporo. Since in actuality I needed no incentive to go and check the place out, that was all the incentive I needed to finally go to the one I spotted in Susukino and see if it was any good. Soup curry for beginners - curry in the form of a soup that's served with lots of meat and vegetables in the soup and with rice on the side that you can do with what you wish. It originated in Sapporo and as yet there's no massive nationwide chain, or in fact much similarity at all between the different shops. Some shops use vaguely Indian spices, while a lot of them have a hint of Indonesian or Thai flavour to them. But it's always grounded in a uniquely soup-curry taste. I can probably stop doing this spiel whenever I talk about soup curry can't I? There are some small chains with multiple shops in Sapporo and a few have even opened in Tokyo I think, but I find that sometimes flavour can vary between different branches of the same chain so I'm reluctant to review all of one company's restaurants on the basis of visiting one. Anyway, this was the Odori/Susukino Samurai I went to, accessed via street level but spread over the second and third floors of the small building it's in. The place was nice and cozy and the soup curry was excellent. The soup was nice and thick in comparison to many other places, and it had a very full, rich flavour. 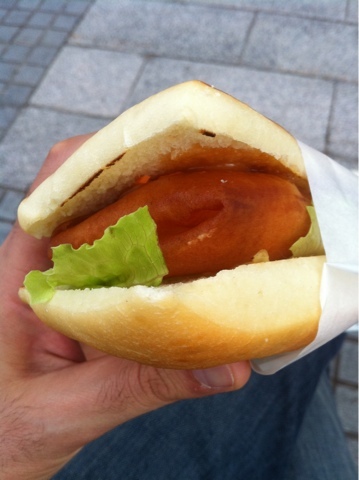 Yuki had the monthly special which was this chicken pumpkin thing, pumpkin soup too! Her comments afterwards were that she was blown away by the first six mouthfuls, but that after that it was maybe a bit too rich and there was too much chicken. I hardly need say that this won't be a problem for others. I went for the buta kakuni (slow cooked pork) which is something I really like trying everywhere. There's a choice of six curries but I had the regular and it was pretty wonderful. In fact the soup was so good, and so flavoursome that I regretted getting the mozzarella cheese topping for it since it really ended up confusing the otherwise wonderful taste. Then, choosing spice levels and toppings are part of the fun of soup curry. Next time I'll keep it simple. I had spice level 4, the highest you can go before they start dropping chillis in and charging more, and it was nicely spicy. Nothing to worry about if you like spicy food. The vegetables here were crisper and less cooked than a lot of the places I've been too recently, and to be honest I prefer them softer than this with soup curry. But the pork was cooked to perfection, so I assume that's the way they do their veg here and some people will love it. There was certainly a nice selection as you can see. I don't know that this is the best place in Sapporo, but to be honest considering the number of Soup Curry places out there I doubt I'll ever find that holy, curry-filled grail. It was great though, and I'd love to go back. There are four branches scattered around Sapporo that you can find from their website that I've linked to at the top, and I'll put this city centre one on my map. Ahhhh, I love soup curry. A bit too far to be of use to most people, this one. Still, their bagels and donuts were just heavenly and if you live in the North of Sapporo, or better yet in Shin-Kotoni, then it's nice to know there are nice places around. Right? Kenon is a stylish little place in a very suburban part of Northern Sapporo that clearly knows its target market is mums and housewives. They had mother's magazines and I'm pretty sure that they're a very 'baby friendly' place considering there were two very young babies while we were there. So it's not a hipster hang-out, but it is very minimal and chic, and really stands out in the area it's in. It has a small cafe space attached, but I think that Kenon's main thing is baking bagels and donuts for take-out. And they're damn good bagels and donuts, let me tell you. We had chicken and salmon bagel sandwiches, amazing filled donuts and I got a herb sausage bagel to take away that turned out to be a bagel with a whole sausage running through it. It was all seriously good stuff and strongly recommended. The coffee was good and the people were super friendly. As I said it's probably too far out for anyone to justify the trip out there, but if you're in the area it's great to know about. I've stuck it on my map... here. Well! It looks like google are upping their 'blog' game and, in addition to google-izing the blogger interface they've finally got around to an iPhone app! So, consider this an on the road test post. Blogging from the palm of my hand. Already I am skeptical. Sapporo Autumn Fest is actually a lot of people's favourite festival in Sapporo it turns out. 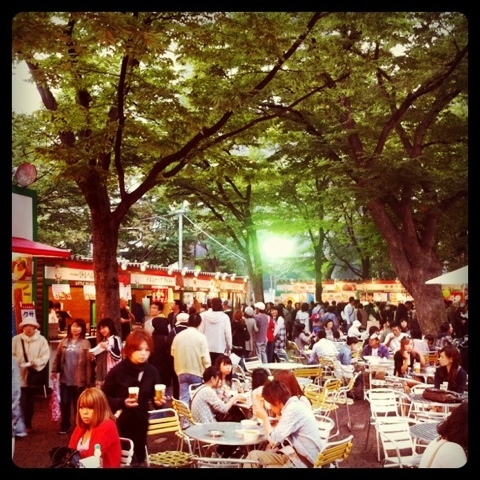 In the winter the central stretch of Odori Park is turned into the Snow Festival, and in the summer it turns into an endless sea of drunk people for Beer Garden. I love them both, but not everyone does, and it seems a bunch of people I've spoken too much prefer the relatively young Autumn Festival, which is all about food. Sapporo Autumn Festival has been held every Autumn since 2008, and yes, the had "since 2008" written on the poster in 2008. That's just how they roll here. It's been getting bigger every year, and that's good for the variety of food on offer, but bad if you don't like crowds, or spending a long time waiting to buy food from a stall. Oh, by the way, this year's Autumn Fest us still going on - but only until tomorrow, October 2nd. So you have a chance to check it out... but not much of a chance. This years Autumn Fest takes up five blocks, each one having a different theme. There's a welcome area, a block for ramen and new food from all over Hokkaido, a block for restaurants from Sapporo itself to have stalls, one for wine and... classier things, and probably the best one - other food from all around Hokkaido. The new food area has been rotating dishes and I think the food there is part of a competition, but it's expensive and has an annoying ticket-based system. The other area for local Hokkaido foods is more of a farmers' market affair and I had good food from there without having to queue much at all. Hokkaido is famous for good food, Hokkaido people are proud of their produce and it's really a no brainer to have a food festival right in the middle of town. It's well worth checking out - uh, if not this year then next! I think this app thing is just going to dump all my photos down at the bottom in a jumble, so I'll just tell you what I ate and you can work out for yourself what's what, ok? 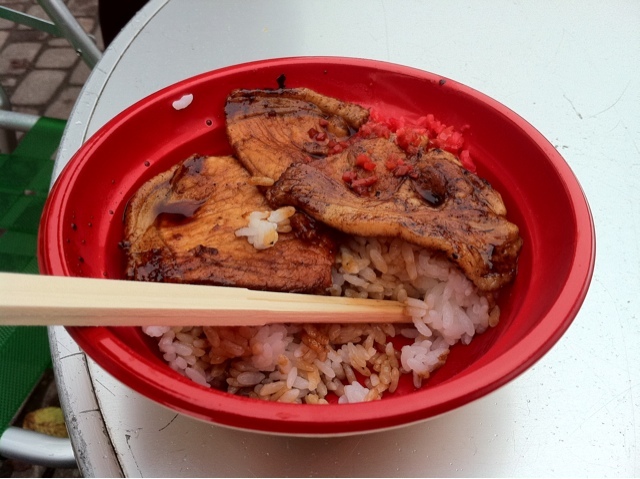 I had amazing buta-don (pork rice bowl) from Obihiro, which is apparently famous for the stuff. 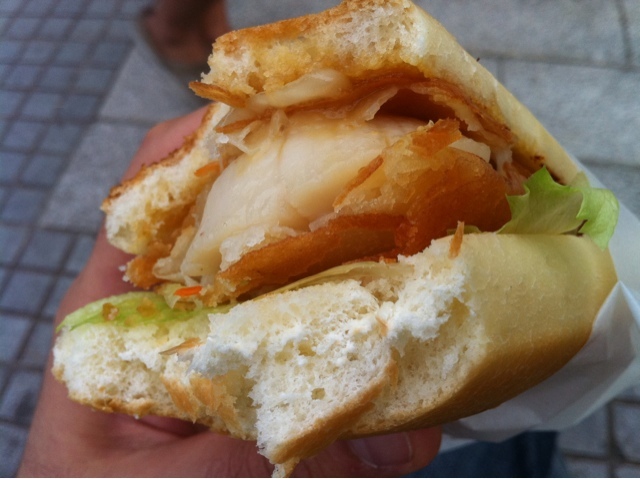 I had a menchi-katsu (minced meat cutlet) burger from Eniwa that was pretty good, and an amazing jumbo scallop burger (pictured both pre and post bite) that kind of blew my mind. 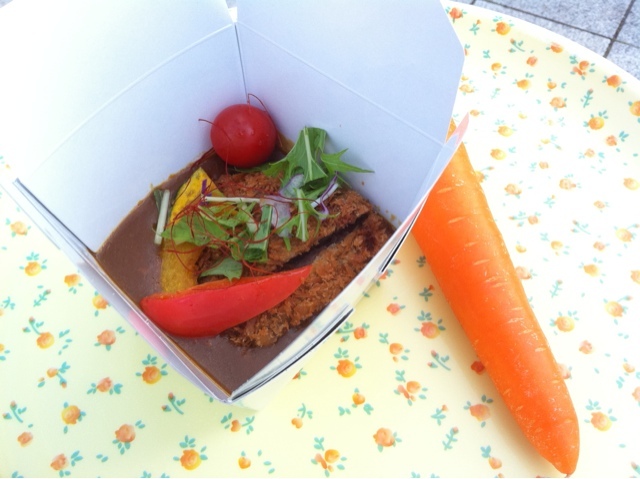 There's also a deer-cutlet curry there that came with a free carrot! Other things I tried that aren't pictured included potato and crab balls, sausages, sea-urchin rice and sea food curry. I went quite a lot. 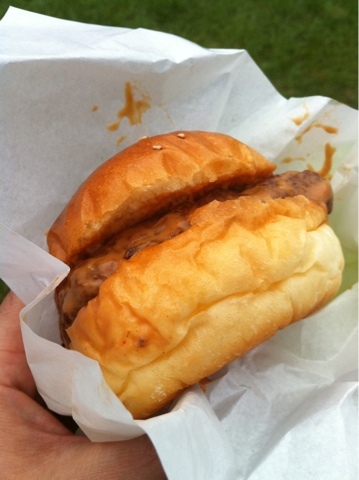 So, another great festival in Sapporo and yet more great food. Can't say fairer than that.